Crossed Industries offers a wide variety of Skid Plates for your truck’s every need. 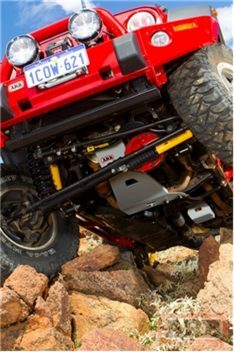 If you want to take your lifted truck or SUV off-road but are worried about the damage it could cause to your vehicle’s undercarriage, then adding a skid plate is the answer to your problem. Imagine you’re out in the woods off-roading and having a great time when your engine dies. If you crawl underneath and find that a rock holed your gas tank, at the worst you’ll be stranded for a while. If you find that hole in your oil pan, you’ve got more serious (and expensive) problems. Don’t let either scenario happen to you. Crossed Industries is proud to offer a Skid Plate selection from the following manufacturers: N-Fab, Pro Comp, ReadyLift, and WARN.